Why is this occurring? Perhaps because only slightly more that 15% of all American workers are organized Union members. In nations were Union membership is higher, for example Germany, inequity is much lower. 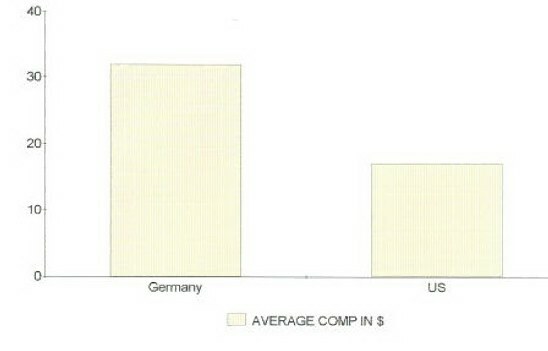 The chart below illustrates the gap between American and German industrial workers. The German worker makes over $30 per hour while the American makes under $20. These figures include health and pension benefits. Is there any coincidence that around 40% of German workers are Unionized while less than 20% of American workers are? There is an obvious correlation between standard of living and Union membership. Maybe American corporations figure they can pay lower wages and benefits because American workers dont realize this. Well Its time to spread the word! All Americans are guaranteed due process and just cause in court. Our Constitution mandates it. But what about at work? Thats a different story. While we spend more than a third of our waking day at our jobs, we are subjected to absolute dictatorship. There is no due process guaranteed at the work place. Further, the growth in popularity of the At -Will clause, which employees are forced to sign, guarantees that any employee can be fired at any time for any reason...or no reason at all! In fact, experts say that America has the worst record of all industrialize nations regarding work place justice. Evidence of this are the 150 thousand employees terminated for arbitrary and capricious reasons annually in the U.S. The ONLY way to guarantee not being a victim of this sort of work place dictatorship is to organize. Forming a Union and obtaining a strong contract assures equity, fair play, and due process in all employment matters.